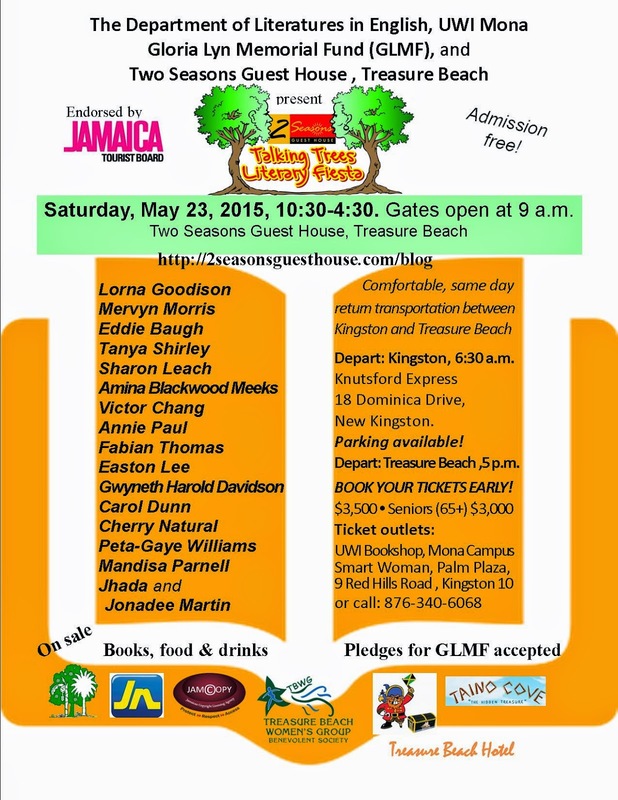 Lovers of Literature and writing will gather again on Saturday, May 23 for the Two Seasons Talking Trees Literary Fiesta at the Two Seasons Guest House in relaxed Treasure Beach. This year’s Fiesta is staged in partnership with the UWI, Mona Department of Literatures in English and the Gloria Lyn Memorial Fund (GLMF), which supports students of literature at The UWI, Mona, promoting the value chain of studying literature through mentoring and the award of an annual cash prize. During the Fiesta, donations will be accepted for the GLMF. Through the works of established and emerging poets and writers of books, blogs and a play, under the theme Those Who Came, Two Seasons Talking Trees Literary Fiesta will recognize the contribution of the various peoples who enrich the cultural fabric of Jamaica. Renowned writer and poet, Lorna Goodison, headlines the stellar line-up, which includes Jamaica’s Poet Laureate Mervyn Morris; UWI Professor Emeritus of English Eddie Baugh; lecturer and poet Tanya Shirley; poet and playwright Easton Lee; storyteller and actress Amina Blackwood Meeks; performance poets Cherry Natural and Peta Gaye Williams, and blogger and researcher at UWI, Mona Annie Paul. Novelists include Musgrave medalist and Observer Bookends editor, Sharon Leach; retired UWI lecturer, writer and editing professional (Journal of West Indian Literature; Pathways, a journal of creative writing), Victor Chang; author of the award winning Mountain of Inheritance, Carol Dunn; author of Young Heroes of the Caribbean and writer for young adults, Gwyneth Harold Davidson; twin teen novelists of the fantasy fiction, The Fallen Empire, Jhada and Jonadee Martin; and author of the romance novel, The Boy Next Door,Mandisa Parnell. Theatre practitioner Fabian Thomas restages his ten-minute play, Devon, and also serves as the day’s host. The programme includes an Open Mic segment. Xavienne Roma Richardson, the first recipient of a GMLF scholarship, will read an excerpt of Gloria Lyn’s piece, Memories from a Jamaican Village, published in Ray Chen’s book, The Shopkeepers. Mr. Chen will be on site to sign copies of his books. The UWI Bookshop will have books by the writers for sale and the Treasure Beach Women’s Group will have second hand books available. There will be booths with produce, craft and other items for browsing and purchase and tasteful food and drink will be on sale throughout the day. In recognition of Labour Day and to promote the planting of trees to feed people, create jobs and benefit the environment, the Trees that Feed Foundation will symbolically present two fruit trees to the proprietor of Two Seasons Guest House. Same day return transportation from Kingston to the Fiesta has been arranged, departing from Knutsford Express, 18 Dominica Drive, New Kingston at 6:30 a.m. and from Treasure Beach at 5 p.m. Tickets are $3,500 and $3,000 for seniors 65 years and over and are available from the UWI Bookshop, Mona Campus and from Smart Woman, Palm Plaza, 9 Red Hills Road, Kingston 10, or call 876-340-6068. The Fiesta is endorsed by the Jamaica Tourist Board, with sponsorship from Jamcopy, the Jamaica copyright and licensing agency, Jamaica National, Taino Cove Guest House and the Treasure Beach Hotel. This is the fourth staging of the Two Seasons Talking Trees Literary Fiesta, which presents a family atmosphere, with a children’s programme running concurrently with the activities on the main stage. Secondary schools in surrounding parishes are being encouraged to make arrangements for students of the upper grades to attend. The soundscape includes recorded talk, and a live drumming display by young, local drummers. There is no cover charge for The Two Seasons Talking Trees Literary Fiesta, which is a highlight of a holiday weekend of activities in Treasure Beach.